Created in association with Smithsonian Institution, this authoritative guide features more than 500 rocks and minerals. Packed with photographs and details on characteristics, distinguishing features, and more, Smithsonian Handbooks: Rocks and Minerals makes identification easy. Designed for beginning and experienced collectors alike, this guide explains what rocks and minerals are, how they are classified, and how to start a collection. Look up different rocks and minerals, and find clear, annotated photography to pick out the key distinguishing features. Learn the differences between igneous, metamorphic, and sedimentary rocks, and reference the glossary for many more technical and scientific terms. 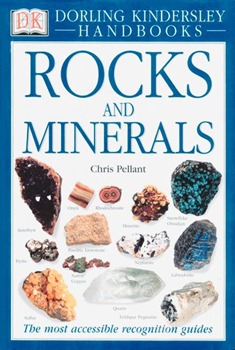 Smithsonian Handbooks: Rocks and Minerals is filled with information about characteristics, colors, unique attributes, and more, making it one of the clearest identification guides for rock and mineral enthusiasts.